Money Drain: Would you spend $189,000 for a night in Vegas? Hope that red bull was worth it! I won’t put this on my tally for amount of money wasted so far, but I had to share. 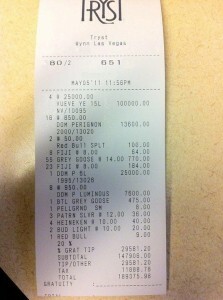 For what it’s worth, this receipt cost more than my house. This entry was posted in Funny Money, Money Drain Stories and tagged mcspending, money drain. Bookmark the permalink.